Unless you’re taking your practical driving test at a rural test centre, then it’s likely you’ll encounter buses and bus lanes during your driving test. A question occasionally asked by qualified and learner drivers is ‘Do buses have right of way?’ Bus drivers must comply with the rules of the road just as other drivers. However, often with many passengers, bus drivers have a strict time schedule that must be kept to and allowing right of way to a bus is often more courtesy rather than law. When should you give way to a bus? Essentially you should give way to a bus whenever it is safe to do so. An example could be that you’re driving in slow moving traffic on a major road and a bus is waiting at a junction to enter your road. If safe to do so, stop and allow sufficient gap for the bus to exit the junction onto your road. More commonly, you’ll notice buses pulling over at the side of the road at bus stops. When a driver is ready to rejoin traffic flow, they will signal their intention by indicating to the right. If you are within a safe distance behind the bus, slow down to allow the bus to move off. Allow the driver to move off in their own time and avoid flashing your headlights. 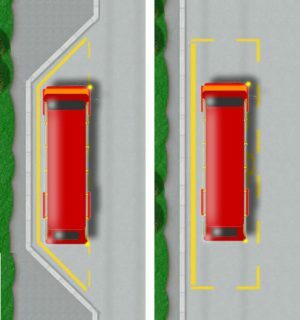 Buses are large vehicles and will often need extra room to manoeuvre, especially on roundabouts and smaller junctions. Keep your distance and give the bus room to manoeuvre (see driving near large vehicles tutorial). Another benefit of keeping your distance is that buses frequently pull over to the side of the road at a stop. Keeping your distance allows you to see past the bus to see if it’s safe to overtake. You can judge when a bus is going to move out from a bus stop by looking at how many passengers are entering or exiting the vehicle and make a decision on whether to overtake or wait for the bus. Be cautious of pedestrians who have exited the bus crossing the road. Avoid becoming desperate to pass the bus in fear of it impeding your progress. Buses stop frequently so the chances are that it will pull over very soon, allowing you to pass. Unauthorised vehicles entering a bus lane during its hours of operation will not only instantly fail a driving test, but could incur a fine due to cameras being located at certain bus lanes. Take note of signs that warn you in advance of bus lanes ahead. A bus lane sign may or may not display its hours of operation. If the sign displays no hours of operation, this means that the bus lane is in operation 24 hours per day, 7 days per week. Other lanes may operate on a part time basis. If you are on a practical driving test and avoid a bus lane that is not in operation, you may potentially fail the test. 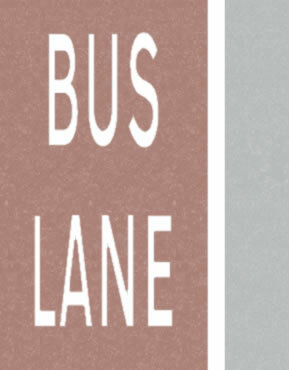 Bus lane road markings are usually clearly distinguishable, often with a different coloured tarmac and are usually separated from other lanes via a wide continuous solid white line. 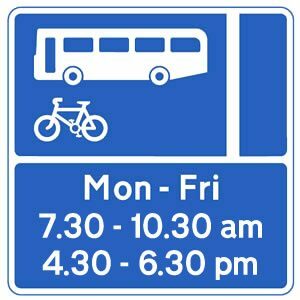 Vehicles typically permitted to use a bus lane during its hours of operations are buses and coaches, taxis and cyclists.